By placing an order either over the phone, fax, e mail or web site, customer has verbal or written agreement, and is bound to Perfect Clean's Terms and Conditions. 1.1.1 The customer agrees to sign and return the Agreement and Direct Debit forms to Regular Cleaners prior to the first cleaning visit. 1.1.4 Minimum duration of 3 hours per cleaning visit applies for all domestic cleaning services. 1.1.5 The sales advisors can only give a rough estimate of the duration of the cleaning service, which is based on a basic description of the customer's house. Please note that duration may vary therefore a degree of flexibility is required. 1.1.6 Customer agrees to provide a task list and all necessary cleaning detergents and equipment for the required work, unless other arrangements have been made with Perfect Clean. All cleaning equipment should be safe and in full working order. 1.1.7 If the customer does not have cleaning detergents and asks Perfect Clean to purchase requested items on their behalf, customer understands that an applicable charge will be assessed. 1.1.8 If collection of keys is required from a location outside the postal code area of the cleaning scheduled, £15 (excl. VAT). 1.1.9 Monthly payment will be refunded only if customer does not require cleaning services for more than 4 consecutive weeks. 1.1.10 Perfect Clean will not be responsible for triggering any alarm systems. Customer should give any special instructions for deactivation/activation of any household alarm systems. 1.1.11 30 days minimum contract length applies for 'Bronze', 'Silver' , 'Gold' and 'Platinum' packages. 1.2.1	Perfect Clean reserves the right to amend the initial quotation, should the client's original requirements change. 1.2.2	If collection of keys is required from a location outside the postal code area of the cleaning scheduled, £15 (excl. VAT) charge will apply. 1.2.3	The customer understands that the price quoted is not a "package deal" and includes only cleaning labour. 1.2.4	Minimum duration of 4 hours per cleaning visit applies. 1.2.5	Customer agrees to provide a task list and all cleaning detergents and equipment (vacuum cleaner, mop, bucket and portable ladder) required to carry out the service, unless other arrangements have been made with Perfect Clean. All cleaning equipment provided by customer, should be safe and in full working order. 1.2.6	The sales advisors can only give a rough estimate of the duration of the cleaning service, which is based on a basic description of the customer's house. Please note that duration may vary therefore a degree of flexibility is required. 1.2.7	If the customer does not have cleaning detergents, Perfect Clean will supply all necessary cleaning detergents for additional £2 per hour. This has to be requested at the time of the booking. 1.2.8	The customer is advised that an end of tenancy cleaning may take double the length of time required for a general cleaning. After Builders Cleaning, After Party Cleaning or Badly neglected homes may take up to three times longer than a well maintained home requiring general cleaning. 1.3.1. Perfect Clean reserves the right to amend the initial quotation, should the client's original requirements change. 1.3.2. Minimum duration of 3 hours per cleaning visit applies. 1.3.3. Customer agrees to provide a list of tasks and all cleaning detergents and equipment needed for the required work, unless other arrangements have been made with Perfect Clean. 1.3.4. All cleaning equipment should be safe and in full working order. 1.3.5. If the customer does not have cleaning detergents, Perfect Clean will supply all necessary cleaning detergents for additional £2 per hour. This has to be requested at the time of the booking. 1.3.6. If collection of keys is required from a location outside the postal code area of the cleaning scheduled, £15 (excl. VAT) charge will apply. 1.3.7. The customer understands that the price quoted is not a "package deal" and includes only cleaning labour. 1.3.8. The sales advisors can only give a rough estimate of the duration of the cleaning service, which is based on a basic description of the customer's house. Please note that duration may vary therefore a degree of flexibility is required. 1.3.9. 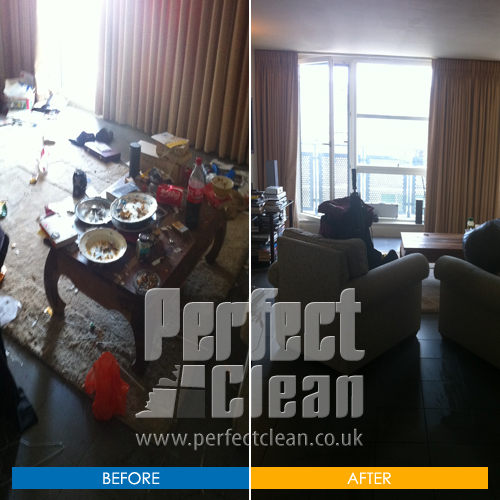 The customer is advised that an end of tenancy cleaning may take double the length of time required for a general cleaning. Post Construction/ After Builders Cleaning, Post Party Cleaning or Badly neglected homes may take up to three times longer than a well maintained home requiring general cleaning. 1.4.1. 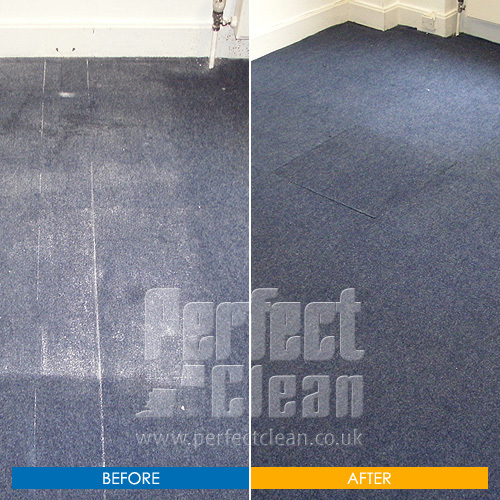 Perfect Clean reserves the right to amend the initial quotation, should the client's original requirements change. 1.4.2. If the customer has a dog, cat or other hairy pet then an extra 30% charge will be added to the service price due to the extensive amount of animal hair slowing down the cleaning process. 1.4.3. If water extraction is required due to flooding 30% extra charge will be added to the service price. 1.4.4. The client understands that additional Parking and Congestion charge may apply. 1.4.5. All carpet/upholstery cleaning orders are subject to £55 (excl. VAT) minimum call out charge. 1.4.6. If collection of keys is required from a location outside the postal code area of the cleaning scheduled, £15 (excl. VAT) charge will apply. 1.5.1. 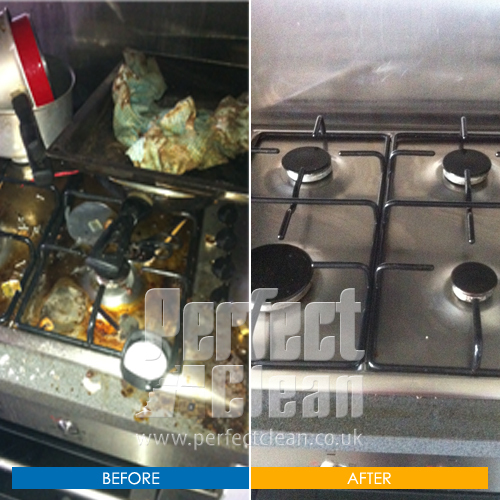 Perfect Clean reserves the right to amend the initial quotation, should the client's original requirements change. 1.5.2. All mattress cleaning orders are subject to £55 (excl. VAT) minimum call out charge. 1.5.3. If collection of keys is required from a location outside the postal code area of the cleaning scheduled, £15 (excl. VAT) charge will apply. 1.5.4. The client understands that additional Parking and Congestion charge may apply. 2.1	Payment is requested on completion on the day of the cleaning session. 2.3	Payment can be made by cheque on completion, please make the cheque payable to 'Perfect Clean'. If paying by cheque, a cheque guarantee card is required and the customer will be responsible for all bank and legal charges resulting from a dishonored cheque. 2.4	Payment can be made with debit or credit card over the phone (This need to be made in advance). If payment is made by credit card 4% surcharge will apply. Perfect clean will not share the customer's card details with a third party. 2.5	The Customer agrees that any outstanding amount owed to Perfect Clean can be charged from the debit/credit card the customer has provided at the time of the booking. 2.6	Customer understands that any 'late payments' may be subject to additional charges. 2.7	If payment is not made after 30 days of invoice then the account will be passed to our collections agency, after which a charge of 15% plus Vat on top of the initial invoice due, will be added to the debt. You agree as part of this contract to pay this sum which represents our reasonable costs in collecting the unpaid amounts. 3.1	The customer accepts and understands that poor service, breakage/damage or theft must be reported within 24 hours from the service date. Failure to do so will entitle customer to no refunds or recovery cleanings. 3.1.1	Perfect Clean requires the presence of the customer or his/hers representative in the beginning and at the end of the cleaning session as an inspection can be carried out and if any corrections, should be made on the same day. 3.1.2	If the customer has scheduled an inventory check then it must be scheduled to commence no later than 24 hours after the cleaning job has been carried out. 3.1.3	Perfect Clean may take up to 7 working days to respond to a complaint. 3.1.4	Perfect Clean will not accept a complaint based on an Inventory check report, filed more than 24-hour after the cleaning session. 3.1.5	Complaints are accepted verbally over the phone and in writing (letter, e mail or Fax). Complaints must be reported on completion or in the following 24-hour. 3.2	All fragile and highly breakable items must be secured or removed. Items excluded from liability are: cash, jewelry, items of sentimental value (the customer will be credited with the items present cash value), art and antiques. 3.3	Key replacement/locksmith fees are paid only if keys are lost by our operatives. There is a £30 per household liability limit. 3.4	Perfect Clean agrees to keep all customers' information confidential. 3.5	In case of damage Perfect Clean will repair the item at its cost. If the item cannot be repaired Perfect Clean will rectify the problem by crediting the customer with the item's present actual cash value toward a like replacement from a Perfect Clean's source upon payment of cleaning services rendered. 4.1	Perfect Clean has a Public and Employer's liability insurance. 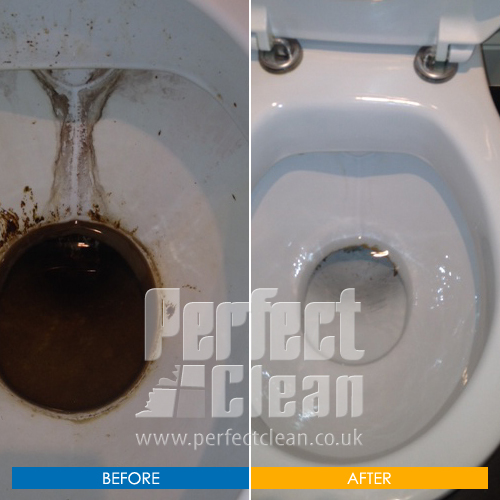 The policy will cover any accidental damages caused by an operator working on behalf of Perfect Clean, reported within 24 hours of service date. 4.2	There is £350 excess on any claim, of which £150 are paid by customer and £200 by Perfect Clean. 4.3	Perfect Clean reserves the right to refuse to share any of the confidential company's documents. 5.1	Customer understands that he/she is not entitled to any refunds. 5.2	If the customer is not completely satisfied with a cleaning job, Perfect Clean will re-clean any areas and items to customer's satisfaction. Therefore customer must allow the cleaner to be returned. 5.3	Customer must be present at all times during the recovery-clean. Perfect clean reserves the right not to return a cleaner more than once. 6.1.7	Any damages caused by a faulty or not in full working order detergents/equipment supplied by the customer. 6.1.8	If the customer has got items which need special cleaning methods and special cleaning detergents, Perfect Clean reserves the right to refuse the provision of the cleaning detergents. 7.1.1	Customer may cancel or adjust the time of a cleaning visit/s by giving at least 24 hours advanced notice. 7.1.2	Customer agrees to pay the full price of a cleaning visit if the customer cancels or changes the date/time less than 24 hours prior to the scheduled appointment. 7.1.3	Customer agrees to pay the full price of the cleaning visit in the event of a lock-out caused by our cleaners being turned away; no one home to let them in; or problem with customer's keys. 7.1.4	If keys are provided they must open the lock without any special efforts or skills. 7.1.5	Customer agrees to pay the full price of one cleaning visit in case of a termination of the service if the customer has given less than one week advanced notice. 7.1.6	Customer may terminate the cleaning service by giving thirty calendar days (30 days) advanced notice in writing(also via email) and specifying the last cleaning date and give reason. 7.2.1	48 hours notice is required if customer should either decide to cancel or re-schedule a cleaning appointment. 7.2.2	Customer agrees to pay 40% of the quote as a cancellation fee if the customer cancels or changes the date/time less than 48 hours prior to the scheduled appointment. 7.2.3	Customer agrees to pay 40% of the quote as a cancellation fee in the event of a lock-out cased by our cleaners being turned away; no one home to let them in; no water or power available at customer's premises; or problem with customer's keys. 7.2.4	If keys are provided they must open the lock without any special efforts or skills. If an initial deposit has been paid to Perfect Clean then the customer agrees that deposit funds may be used to cover the cancellation fee. 7.3.1	48 hours notice is required if customer should either decide to cancel or re-schedule a cleaning appointment. 7.3.2	Customer agrees to pay 40% of the quote as a cancellation fee if the customer cancels or changes the date/time less than 48 hours prior to the scheduled appointment. 7.3.3	Customer agrees to pay 40% of the quote as a cancellation fee in the event of a lock-out cased by our cleaners being turned away; no one home to let them in; no water or power available at customer's premises; or problem with customer's keys. 7.3.4	If keys are provided they must open the lock without any special efforts or skills. If an initial deposit has been paid to Perfect Clean then the customer agrees that deposit funds may be used to cover the cancellation fee. 7.4.1	48 hours notice is required if customer should either decide to cancel or re-schedule a cleaning appointment. 7.4.2	Customer agrees to pay 40% of the quote as a cancellation fee if the customer cancels or changes the date/time less than 48 hours prior to the scheduled appointment. 7.4.3	Customer agrees to pay 40% of the quote as a cancellation fee in the event of a lock-out cased by our cleaners being turned away; no one home to let them in; no water or power available at customer's premises; or problem with customer's keys. 7.4.4	If keys are provided they must open the lock without any special efforts or skills. If an initial deposit has been paid to Perfect Clean then the customer agrees that deposit funds may be used to cover the cancellation fee. 7.5.1	By entering into a service agreement with Perfect Clean, the customer agrees that after the termination of the cleaning service he/she will not hire or use any domestic services provided by a present or past cleaner introduced to the customer by Perfect Clean. If the customer wishes to hire or use domestic services provided by such a cleaner then he/she must pay a referral fee of £400. These terms and conditions shall be governed by the relevant United Kingdom law, and by agreeing to be bound by them the customer agrees to submit to the exclusive jurisdiction of the relevant courts of the United Kingdom. Perfect clean reserves the right to make any changes to any part of these terms and conditions without giving any prior notice. Should any of the above clauses change all existing customers will be notified. Please check this website for updates.